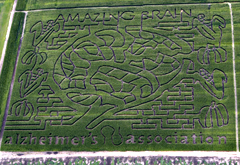 Cornfield mazes are plentiful in Iowa at this time of year but none are quite like the Amazing Brain Maze in far southeast Iowa’s Lee County. Kathy Hohl is co-owner of the ten-acre cornfield maze near Donnellson into which a giant brain is carved from the stalks. Part of the proceeds raised from admission and donations will benefit the Iowa chapter of the Alzheimer’s Association. Hohl explains the motivation behind the maze. Hohl says, “Each of our staff, from my immediate family to the other six, eight, ten of our staff members have all in some way been impacted with someone in their family being diagnosed with Alzheimer’s…whether it was a parent, parent-in-law, aunt or great aunt.” The twists and turns of the maze are patterned after the convolutions in the human brain. Hohl says brain-themed questions are posted at the main intersections, providing education — and clues to reaching the end of the maze. A brain, by the way, weighs about three pounds. The maze will be open through Halloween. For information on the maze at the fourth-generation farm, call (319) 470-1558 or visit “www.kathyspumpkinpatch.com”. Some 65,000 Iowans are now living with Alzheimer’s, the fifth-leading cause of death for people over the age of 65. For details about the state chapter of the Alzheimer’s Association, visit “www.alz.org/greateriowa“.